Four immaculate spacious rooms, each with a private bathroom and air conditioning, offering peace and tranquility in El Centro. Have the convenience of short walks to Merida’s sights, yet a green and quiet oasis for relaxing and sleeping. We are part of the colonial heritage of the White City, as Merida is known, offering you great rates and convenient location. Just walking distance of the Plaza Grande(the main town square) and a few short blocks from Paseo de Montejo, Merida’s Champs Elysee. Let’s not forget that CASA ANA is only 20 minutes from the Merida International Airport and a little more than 40 minutes from the wonderful beaches of the Gulf of Mexico. Come and enjoy our city, visit the Plaza, the oldest cathedral in the Americas, the town hall built in 1735, and Casa de Montejo, the former home of the conqueror of Yucatan built in 1542. That’s right! Merida is over 450 years old! 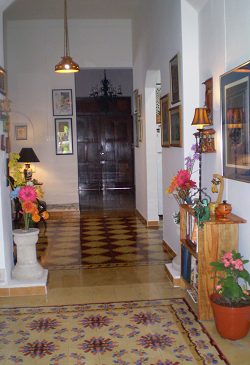 CASA ANA will make your visit an enjoyable and relaxing experience. Explore the fascinating Mayan ruin sites, ecological wonders, and cenotes (deep crystalline water-filled sinkholes) surrounding Merida. This is a late post. I visited Casa Ana while on photography assignment in Merida. From the moment you step into the B&B, you’ll feel the tranquil environment. Merida was brutally hot in July so this B&B was a nice retreat with its pool and lounge areas from the heat. Every morning a homemade breakfast was served – quite filling and delicious. The rooms were simple yet perfect for my needs at my budget. Location was central to everything – just keep in mind that Merida is a good walking city. The owners were awesome. Their hospitality and humor made me my stay so pleasant. They even booked my tour to the cenote and Chichen Itza. Overall, it was perfect and I highly recommend this local and authentic and delightful retreat.